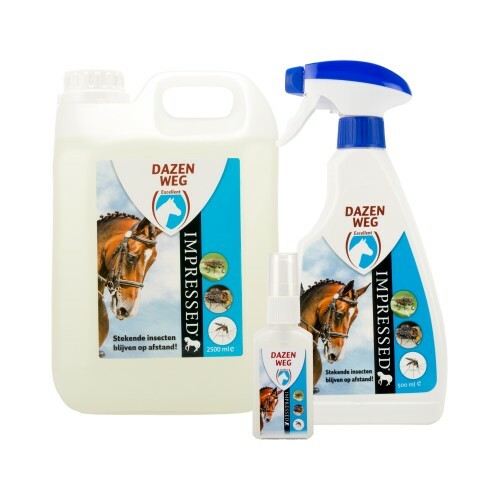 Excellent Dazen Weg (Horseflies Begone) is used to protect the horse and rider from flying insects (mosquitoes, horseflies, wasps and hornets) and ticks. Excellent Dazen Weg (Horseflies Begone) is used for horses bothered by insects, and helps to combat flying insects and ticks. Dazen Weg is 100% biodegradable, guaranteed doping free (certified) and works for up to 6 hours. The effectiveness of Dazen Weg depends on the activity level of the horse. Intense exercise creates more perspiration, causing the period of effectiveness to be shorter. Below is a description of the use of Dazen Weg, depending on the horse's activity level. Spray the horse from a distance of 30 to 40 cm. The product can be rubbed in, using a cloth or sponge, onto the head, or if you have a jittery horse. Avoid contact with eyes and other mucous membranes. Spray well under the abdomen and neck. Can be used in combination with a fly blanket. Depending on weather conditions (i.e. rain) repeat the treatment for extended effectiveness. Effective for approximately 4 to 6 hours. Spray the horse at a distance of 20 to 40 cm. (Not under the saddle/saddle blanket). You can rub the product, using a cloth or sponge, onto the head, or if you have a jittery horse. Avoid contact with eyes and other mucous membranes. Spray well onto the chest, neck, abdomen and hindquarters of the horse. When sweating, we recommend you repeat the treatment to extend the duration of effectiveness. Depending on the activity level, Dazen Weg will be effective for approximately 3 hours. Spray the horse at a distance of 20 to 30 cm (not under the saddle/saddle blanket). Spray well on the chest, neck, abdomen and hindquarters. You can rub the product, using a cloth or sponge, onto the head, or if you have a jittery horse. For intensive activities, the spray is effective for a maximum of 1 hour. If there is excessive sweating, we recommend repeating the treatment after 20 minutes to extend this duration. Please note: avoid contact with eyes and other mucous membranes. Spray the uncovered body parts from a distance of 20 to 30 cm. Avoid contact with eyes and other mucous membranes. Depending on the effort level, the spray is effective for several hours. Have you used Excellent Dazen Weg (Horseflies begone) before? Let us know what you think about this product. Works really well against the dreaded horse flies.